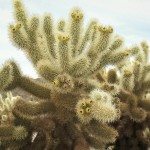 Cacti are amazing plants with unique adaptations that allow them to thrive in inhospitable terrain. One of these adaptations is spines. Most spines are large thorny looking things but some are fine and hairy, developing in clusters and may ring around the large spikes. These are called glochid spines. Plants with glochids are in the Opuntia family, as other cacti do not bear glochids. Cactus glochids are not a feature with which to fool. Glochids in skin are irritating, difficult to remove and stay in for a long time. What are glochids? They are fine, hairy spines tipped with barbs. That makes them hard to get out of skin and the irritation persists for days without treatment. It’s wise to wear gloves and long sleeves if you are handling any of the plants in the Opuntia family. Failure to do so may result in some terrible itching and burning. Glochids occur in tufts, often around a main spine. They are deciduous and have backwards pulling barbs that resist removal. Glochid spines dislodge with even the gentlest touch. They are so fine and tiny that removal is almost impossible. You can barely see them but you can sure feel glochids in skin. The interesting thing about plants with glochids is that they form to help conserve moisture. They are actually modified leaves, unlike thorns, which are modified branches. Leaves like these prevent the plant from losing too much moisture in the form of evaporation. They are also a formidable defense strategy. The only group of plants that produce ghlochids are the Opuntioideae. The fine hair-like spines are clustered in the areoles of cacti in that family. Prickly pear or cholla are two species with glochids. In fact, the picking of the fruit from prickly pear is always done in long pants and sleeves, and is suspended when there is wind to prevent the fine spikes from drifting onto workers and only when the fruit has been wetted. Many of the other cactus plants in the family will have ghlochids. They may be the only spine or the glochids may be surrounding a larger spine. Even fruit is subject to the irritating tufts. Glochids that get stuck in the skin can produce a stinging, burning, itching feeling combined with dermatitis reactions. These may be blisters, pustules, or welts that are overly sensitive and painful. The condition can persist for up to 9 months if the glochids are not removed. Cactus glochids are so small, tweezers are of little assistance. That said, tweezers are the most effective if you pair them with a magnifying glass and plenty of patience. Duct tape applied on the area and pulled off also has some effectiveness. Additionally, you can try spreading melted wax or Elmer’s glue on the affected area. Wait until the wax or glue sets and then peel off. This can remove up to 45 % of the spines. It is important to get the spines out or the condition will persist and seeking professional medical help is necessary.